Talking Religion is a research group consisting of 2nd and 3rd year Oxford DPhil students and museum employees, working with members of the Empires of Faith project over the course of 2017. The group is made up of archaeologists, art historians, historians, and linguists, working on a wide range of ancient to modern subjects from across the globe. They have come together to look at the importance of material culture for the study of religion, developing questions and approaches through a series of interdisciplinary workshops, hands-on experiences at both the Ashmolean and the British Museum, and the opportunity to present findings in both academic and public contexts. The research group was organised to coincide with the Imagining the Divine exhibition on Buddhist, Christian, Islamic, Jewish and Hindu art of the first millennium AD in the Ashmolean. The exhibition will run from October 2017 to February 2018, where the students will present their research to a mix of public and academic audiences. Talking Religion has aimed to encourage collaborative work by students from across a range of departments, and to foster long-term relationships between students and the Ashmolean. This is the first time that the University of Oxford, the Ashmolean and the British Museum have been brought together to run a programme aimed at students, and has been made possible thanks to the AHRC-TORCH graduate fund. Further details of the programme can be found here. What can we learn by comparing Christian images to Buddhist? What does death have to do with pilgrimage? And what makes a space sacred? 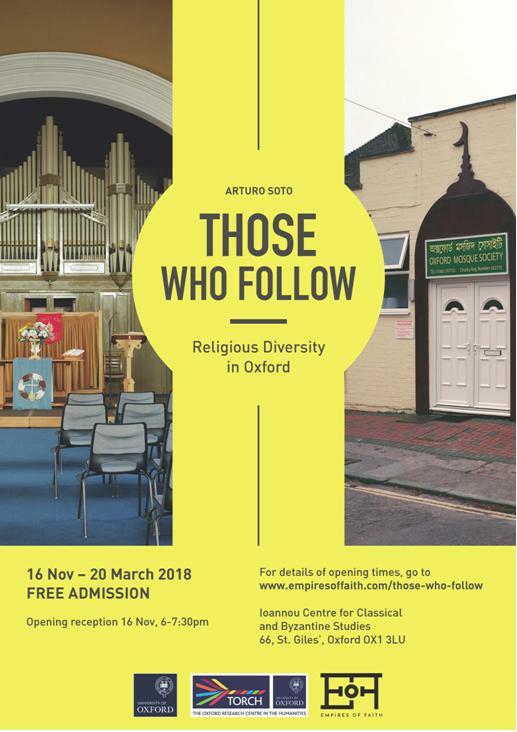 In this series of talks by doctoral students at the University of Oxford, pairs of researchers open up the stories of two objects from diverse traditions, but with a lot in common. Take a deeper look at the objects of Imagining the Divine, and get a taste of the cutting edge research behind the exhibition. Free with entry to the exhibition, no booking required. Dominic Dalglish discusses the proceedings of the first workshop that focussed on how we can use material culture to study religion. Philippa Adrych discusses the second workshop focusing on comparative techniques for the study of religion through material culture. Penny Coombe and Sajda van der Leeuw respond to the second workshop on the use of comparative approaches to the study of religion through material culture. Stefanie Lenk and Sylvia Alvares-Correa discuss the proceedings of the third workshop, hosted by the Ashmolean museum, that focused on what a religious object is. Dominic Dalglish reports on the group’s fourth and final workshop of the term, hosted by the British Museum, focussing on how we overcome the triviality of objects. Sylvia Alvares-Correa is a DPhil candidate in History of Art at the University of Oxford, specializing in Early Netherlandish art. Her project considers the Netherlandish works of art associated with Dona Leonor of Portugal (1458–1525). As the wife of King João II and sister of his successor, Manuel I, Dona Leonor was one of the great patrons of early modern Portugal, and, significantly, many of the Netherlandish artworks found in Portugal from this period are associated with her, though her role in their acquisition has long been overlooked. While structured around a single patron and examining a contained component of her patronage, it will contribute to the broader understanding the patterns of gift exchange between royal courts, artistic transfer between the northern and southern Europe, and the social and devotional functions of art within female communities, both noble and religious. Sylvia holds an MA in Early Netherlandish Art from the Courtauld Institute and a BA in History and History of Art from the University of St Andrews. She is interested in the role of artworks in constructing and commemorating devotional experiences, especially pilgrimages—both real and imaginary—and the extent to which such artworks were ‘gendered’ (or not!). Although her background is, alas, exclusively in the humanities, she is in awe of recent advancements made in technical art history, and strives to combine traditional art historical methods with material and technical evidence gleaned from the artwork itself. A first year DPhil student in Classical Archaeology, Penny Coombe’s primary research interest is sculpture of the (north western) Roman provinces. Her thesis will consider the networks and associations between visually similar figural motifs from the Rhineland and Moselle regions of the continent and those found in Britain through analysis of case studies. She is very excited to participate in the Talking Religion research group to exchange ideas with specialists of different time periods, geographic regions and disciplines. A Civil Servant for nearly 7 years before returning to study, Penny has also worked at the Museum of London and the London Archaeological Archive and Research Centre. She is co-author of the British Academy funded catalogue of Roman sculpture from London and the South East in the Corpus Signorum Imperii Romani series, and of a couple of other articles on Roman sculpture from Britain. A keen cyclist, she plans to circuit the Roman Empire by bike, having completed the first portion from Rotterdam to Vienna—by way of the Rhine, Moselle and Danube rivers—in summer 2016, logging her travels and visits to 32 Roman sites on her blog. Andrew Doll is studying for a DPhil in History at Lincoln College. His studies focus on the relationship between religion and mapmaking, specifically looking at 17th century maps of towns and cities in the Polish-Lithuanian Commonwealth. He fell in love with Poland and its history while studying for his BA at UCL, at the School of Slavonic and East European Studies (SSEES), and hasn’t looked back since, following this passion with an MSt at Jesus College, and with his current doctoral work. Andrew loves to work with visual sources, hence his focus on cartography, and is always keen to unearth the influence of religion, which he feels is all-too-easily forgotten by historians in today’s secularised world. It’s for this reason that he feels especially excited to be part of the Talking Religion project, and looks forward to learning from, and hopefully contributing to, its multi-disciplined approach to religious imagery. Helena Guzik is a DPhil candidate in History of Art at the University of Oxford, specializing in Italian Renaissance art. She is writing her dissertation on the material culture of pilgrimage in fifteenth- and sixteenth-century Italy, with a focus on the Este family and the ways in which the practice and concept of pilgrimage impacted patronage in the courts of Ferrara and Mantua. Her project will investigate the development of pilgrimage past the medieval into the early modern period, and raises questions about the multifaceted motivations behind undertaking a pilgrimage, the place of popular devotional practices in the lives of the Italian nobility, the role of public performances of piety in cultivating a ruler’s image, as well as how and why pilgrimage was represented or alluded to in the artistic commissions and collections of Italian courts. Helena holds a BA in History and Art History from Fordham University and an MPhil in History of Art and Architecture from the University of Cambridge. She received a Clarendon Scholarship for her doctoral studies, and is the Sarah Louise Dale Renaissance Scholar at Lady Margaret Hall. Prior to coming to Oxford, she worked for several years at The Metropolitan Museum of Art as Managing Editor of the award-winning Heilbrunn Timeline of Art History, among other editorial and production roles. Fuchsia Hart is in the first year of her DPhil in Oriental Studies. She holds a BA in Persian with Old Iranian and an MPhil in Islamic Art and Archaeology, both from the University of Oxford. Fuchsia’s main interest is Iranian Twelver Shi’ism and her research has covered a number of themes associated with the religion, such as depictions of the Battle of Karbala, Shi’i interpolations in the manuscript tradition of Bal’ami’s History and the Mosque of Shaykh Lutfallah in Isfahan, Iran. Her current research focuses on the concept of pilgrimage to shrines of descendants of the Twelve Imams, with the shrine of Fatimah Ma’sumah in Qum, Iran being central to her doctoral thesis. She has lived and travelled extensively in the Middle East and the surrounding region. Hugh Jeffery is studying for the DPhil in Classical Archaeology, and is preparing a doctoral thesis on the archaeology of the town of Aphrodisias during the period AD 700–1300. Hugh’s broader research interests lie in the vernacular material culture of Byzantium, in particular in relation to the contested limits of Orthodox Christianity. He is interested therefore in religious practices of dubious orthodoxy, ranging from early Christian veneration of the archangel Michael to the ‘bells and smells’ of Middle Byzantine funerary ritual. Hugh holds a BA in Classical Archaeology and Ancient History and a MSt in Classical Archaeology, both from the University of Oxford. He has been the recipient of the Mica and Ahmet Ertegun Graduate Scholarship in the Humanities, and currently holds the Shuffrey Scholarship in Architectural History at Lincoln College. Ilenia Scerra works for the Ashmolean Museum in the Events and Registrars departments. She completed an MPhil in Islamic Art and Archaeology at the University of Oxford, focusing her research on the material culture of the Islamic Mediterranean. Among other interests, she studied the practice of patronage and endowment of Qur’ānic manuscripts by members of the Zirid court to the Great Mosque of Qayrawān (Tunisia), with a particular emphasis on the so-called Nurse’s Qurʾān. An inedited bifolio of this lavishly decorated manuscript is featured in the forthcoming exhibition Imagining the Divine. Within the interdisciplinary framework set by Talking Religion, Ilenia is very keen to explore the interrelation between religious objects and political authority from a broad perspective, taking into account the sensitivity associated with these subjects in a public-engagement setting. Ilenia holds a BA in Classics from the University of Catania and an MA in Archaeology from La Sapienza University of Rome. Prior to coming to Oxford, she participated in several archaeological campaigns sponsored by the University of Catania, La Sapienza University of Rome, and the University of Bologna. She also curated a series of workshops of Experimental Archaeology for primary school children, and she interned in the Middle Eastern Department at Sotheby’s, London. Hugo Shakeshaft is a second year DPhil student in Ancient History. His thesis investigates the significance of beauty in Greek religion of the Archaic period, c. 800–500 BCE. From the epic poetry of Homer to statues dedicated to gods in Greek sanctuaries, his research explores a variety of ancient sources to understand how ideas, representations and experiences of beauty featured in ancient Greek religious life. At the core of his work is an interest in how people relate and communicate with gods, and in the relationship between the beautiful and the divine in Greek culture. The perception of beauty seems to be a common aspect of human experience across time and place. And yet every culture has different ideas and ideals of beauty. The complex relationship between ancient and modern ideas about beauty—their simultaneous similarity and difference—is central to Hugo’s research. Hugo holds a BA in Classics from the University of Cambridge. He was a visiting scholar at Harvard University before beginning his Masters in Classical Archaeology at the University of Oxford and subsequent DPhil in Ancient History. Sajda van der Leeuw is a current DPhil candidate in History of Art at the University of Oxford, working on a dissertation on Land Art, Photography and Film. She holds a MA in History of Art from New York University and also a MA in Philosophy from the University of Amsterdam. For the latter, Sajda has written a thesis on “aesthetic presence” and its creation and philosophical reception. Throughout both Masters, Sajda has focused—amongst other things—on Image Theory, or Bildwissenschaft. It is from there that she is currently participating in the Talking Religion research group and the Empires of Faith project, through which she would like to deepen her knowledge of religious objects and their individual ways of conveying presence. She is especially interested to do this from a comparativist perspective, taking a turn to material culture through an investigation of objects in Buddhism, Hinduism, Christianity, Judaism and Islam that all relate to a common theme, for example the “tree of life” or “axis mundi”. This also relates to her current DPhil project and her interest in modern and contemporary art practices that reinvestigate old cultures and reiterate a search for essential questions related to human consciousness, so as to enable a certain “subjective universality” (a term of Immanuel Kant) in their aesthetic experience.